West Paw's Rowdies Fergus is an award winning durable plush dog toy for small dogs with big play drives who has arms and legs that are great for tugging and tossing up in the air. Rowdies Fergus contains two of West Paw's sturdiest technologies: Reinforced HardyTex fabric with mesh backing make up their bodies, and Zogoflex chew zones at the end of arms and legs. for dogs who love to gnaw, chompo and chew. 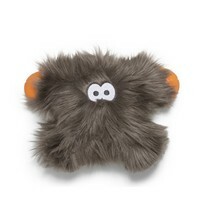 Fergus also has embroidered eyes which cannot be plucked off by teeth, a squeaker to prompt play and is stuffed with West Paw's exclusive eco-fiber IntelliLoft, made completely from recycled plastic.